1. Downtown to the North, ending at the Generic Flower. 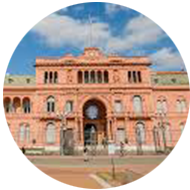 The tour will include the following: Pink House, Metropolitan Cathedral (Pope Francis´church). From there we will take a bus and head to Retiro and walk past Paz Palace, San Martin Palace, Arroyo street, the Embassies of France and Brazil. Alvear Avenue, Recoleta cemetery and the Generic Flower. The first tour focuses more on the elegant side of the Buenos Aires. You will be able to see why the city is called “The Paris of Southamerica”. The second aims to the old part of town and also the most expensive and modern neighborhood Puerto Madero.